Another way to store your little things is by using the Drawer Storage Cabinets. 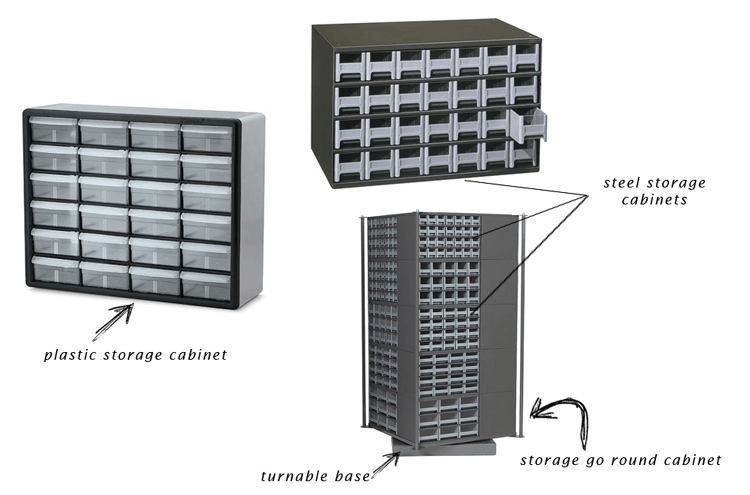 With the choice of plastic or steel storage cabinets, one can have more organized and easy-to-manage work station. You will never have to lose or misplace things ever again! Plastic storage cabinets offer versatile storage for your little goods. They’re stackable as well as mountable on the wall, whichever fits your need and taste. These cabinets are made of high-impact polystyrene, completed with clarified polypropylene drawers with finger-grip drawer pulls. The strong materials make the storage cabinets indestructible, chemical resistant, and see-through. Choices come in 16 drawer, 26 drawer, 24 drawer, 44 drawer and 64 drawer plastic storage cabinets. All these plastic cabinets are currently ON SALE. Grab them while it lasts! The steel storage cabinets are constructed of welded steel equipped with sturdy, high-impact polypropylene drawers. These cabinets are dent-proof and have a molded-in label holder for easy content identification. The transparent windows on the drawers allow users to instantly recognize the stored items inside. Choose from 28 drawer, 20 drawer, 16 drawer, 15 drawer, 9 drawer and 9 drawer security steel storage cabinets. The latter features a locking door for better security. Are you in need of a lot of drawers in one cabinet? Get 20 steel storage cabinets AND one storage go round to contain those steel cabinets. It has a turnable base which allows user to easily find the item he/she wants to take or put back. Could these drawer storage cabinets be the one good solution for you? Check the links above if they are! Nice post with photo thanks for sharing.